← Are Blogs Full of Bad Writing? I Sure as Hell Hope Not! To most people, neither of the words in the title are particularly familiar. Bookworm is the only word known by all, but even that word isn’t associated with the correct definition. Both words in the title have the prefix biblio-, which some know to refer to books. But what do the two words mean and how are they different? The first, bibliophile can be broken into two parts, biblio and phile. Philo is the greek prefix meaning love of or to love. So, putting together biblio (books) and phile (love of) gets you a noun describing a lover of books. Most of you following my blog can appreciate a name like that. To love books for what they hold inside each different binding. Bibliophiles are simple creatures enjoying books for the fantastic innovation they have become for story telling. While many people think a bookworm would be a lover of books, it is defined instead a branch of the bibliophile. A bookworm is a person who loves books for their content, in other words, for reading. Two seemingly synonymous words actually have a different meaning, just a similar starting point. Now what do you think when you hear the word bibliomaniac? Sounds like a crazy person, right? Well, you’ve got the root of the definition right there in maniac. It describes a person clinically crazy about books. Now you’re thinking, that can’t be too bad, can it? It’s a version of obsessive-compulsive disorder (OCD) that revolves around collecting and sometimes hoarding books. Again, not that bad, right? Not necessarily. For some people being obsessed with books isn’t a life goal and it’s difficult to live in the shadow of those who make books their entire life. The above link depicts the life of a man who has oh too many bibliomaniacs in his life. As I read through the story, I felt bad for both the son and his father. The father was addicted to books like drugs, but loved them honestly. He may have neglected his marriage, but he enriched his children and grandchildren with art and history. Unlike most bibliomaniacs, he didn’t hoard books with no point. He was also a bibliophile. He loved them so much that he bought author memorabilia, visited the sites of the famous authors, and passed on the books to his children. The sad part of the story begins when the author’s father suffers a stroke and the vultures of the world swoop down and scarf up his amazing collection of rare books and art like he was already dead. It was a shame two generations before the author had been spent collecting this priceless library only to have it taken away in his father’s sleep. The man had known what his collection was worth in dollars, but it was worth so much more in love and enjoyment. He was devastated to find his priceless companions kidnapped in his absence. He could no longer pass everything down to his son. Even the settlement was not fair to this lover of books. They returned some art, only a few books, and money. Money? Money doesn’t replace the connection the man and his family had to the books. While bibliomania can be considered a curse to some, I’m sure the author respected and treasured the childhood he had because of the love his father and grandfather had for books. The author ends the story on a positive note because the experience with his book-obsessed father has impressed an important moral in his life. That although his father’s books are now passed around throughout the world, that is the true beauty of them. To share books is to realize their importance and create a bond with other people based on those books. Collecting and reading books forms memories that surpass the ownership of those books in one’s life, but never leave the person whose read them. It is a lovely relationships between the imagination and the soul. The author ends the article with the beginning of his book collection. It seems that no matter how hard you try, bibliophiles and bibliomaniacs alike understand the value of books. Appreciating them yesterday, reading them today, and passing them on to future generations tomorrow. 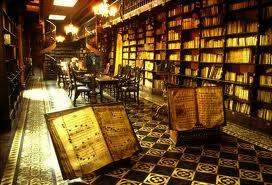 If my library looked like this, it would be worth going crazy over books!